Peter Vardy Jaguar Land Rover has recently opened a brand new, custom-built dealership in Aberdeen which has been revealed to be currently the largest in Europe. The new £8m state-of-the-art dealership brings together Jaguar and Land Rover in one location that has been created to superior standards, using specialist rainscreen cladding systems manufactured by Euroclad company Booth Muirie, to deliver an aesthetic façade that reflects the identity and high-standards of both car brands. The new showroom, owned by Peter Vardy, offers a luxurious experience to its customers, with two floors of new and approved used cars, as well as workshop services, a coffee bar and offices. 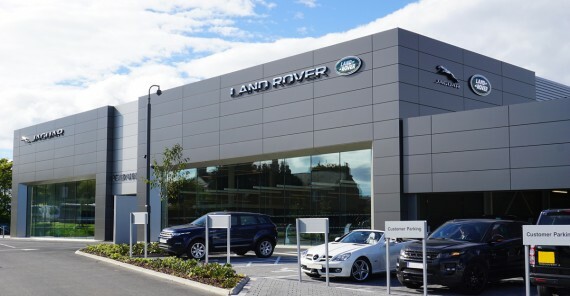 Booth Muirie’s BML120 specialist rainscreen cladding system was specified in Sunshine Grey and Champagne Metallic finishes, matching Jaguar Land Rover corporate colours and reflecting the quality that is associated with the two brands. The attractive new showroom was delivered by Ogilvie Construction with APS Developments responsible for installing Booth Muirie’s cladding system, which forms the greatest part of the showroom exterior and provides both a modern and stylish finish. The BML120 rainscreen system was used to form the exterior walls of the main entrance and showroom, with Euroclad supplying its Elite system to be used for the car park, carwash and maintenance areas. The system was primarily supplied in the Sunshine Grey Metallic finish, with elements of the Champagne Metallic finish being used to surround the windows, which used an angle reveal. The panels were manufactured from Alucobond®, a high-quality, weather-proof aluminium composite material (ACM) that offers architects the freedom and flexibility to create innovative exteriors according to the most precise design brief. The material allows the system to be specified in a wide range of colours to deliver the perfect finish for the project. ACM is comprised of two aluminium skins which sandwich a 3mm plastic core, making it particularly lightweight, rigid and flat in comparison to other metals of a similar overall gauge that are used in rainscreen cladding. This, combined with Booth Muirie’s advanced cutting and routing machinery, allows the ACM to be easily folded and hand-finished to create sleek, flat panels with no loss of rigidity. Booth Muirie’s BML120 system is suited to landscape format panels, which are installed using a tongue-and-groove jointing method for a quick and easy installation. All panels within the BML120 system can be independently removed and replaced, which makes any maintenance to the system straightforward. The Euroclad Elite System offers the design, flexibility and performance to contribute to the quality finish of the showroom. The systems provide thermal insulation using mineral wool, which sits between the external profiles.